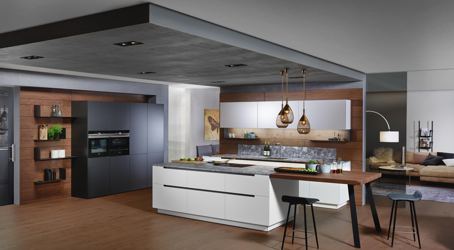 Modern designs, practicality and exceptional quality standards: that’s the secret behind our successful Austrian brand, ewe kitchens. Discover how inspiring kitchens take shape – and inspiring careers too. At ewe kitchens, we develop innovative products to make kitchens more practical and inspiring. A new kitchen should be a pleasure to buy – and a pleasure to own. Our brand has represented modern design and high-quality kitchens since 1967. Our ability to meet our customers' needs has been always the heart of our development. Our products not only look good, but impress inside and out. Everything’s in harmony with practicality, the highest quality standards and the latest design trends. ewe kitchens reflect the customer’s personality – which makes them very special. In the same spirit, we give our people room to learn, grow their skills and be inspired – so our approach to talent is special too. Our brand has stood for quality since 1967. At our production facilities in Austria we rely on highly qualified experts and the most modern production methods.